Even when Digits Trading already has 45 branches nationwide, its founder, Charles Paw, still considers the last two decades as mere series of accidents. “I did not plan any of this. It just happened,” Paw reiterated multiple times when he talked to Entrepreneur.com.ph. The unassuming head of Digits, the company behind Digital Walker, a tech accessory store, and Beyond the Box, the local Apple distributor, still insists he is no studious, but loves reading for 30 minutes every night. He is no engineer, but can easily troubleshoot a PC or assemble a CPU. He is no business grad, but Paw has successfully lived out the classic “overnight success” story. Graduating with a Communications degree in college, Paw saw entrepreneurship as a survival tactic to fend for himself in his formative years after his father let him go on his own after finishing high school. “I was annoyed at first. My friends never had to think of how to sustain themselves for college, so why should I?” Paw recalled in Filipino. But in retrospect, he realized that the last two decades would not have unfolded the way it did if not for his father’s iron fist. Paw sought the opportunity to work in his cousin’s company, a local distributor of basic toiletries, and served as inventories guy, and later on, as sales staff. On the side, already a tech enthusiast, he also started buying computers and parts in Greenhills and sold it to friends. “That experience molded me to learn how to talk to people when I was so shy in high school,” he said. At 17, he learned the ropes of business with the goal to survive another month in school. To keep his finances in check, Paw made sure to reach his personal quota for sales. Such mindset drove him to set up a computer store called “Comwiz” in Retiro, Quezon City with four other friends, where they assembled and sold second-hand personal computers. Without any computer engineering background, he learned the basics of PC assembly all by himself. “It was all diskarte (strategy). We don’t really need inventory since if somebody wanted their computer fixed, that’s when we buy parts in Greenhills. We did it all ourselves,” Paw added. He may have had “little capital” to shell out then, but it prepared Paw for the bigger endeavors he will involve himself in for the years to come. By the time he turned 22, he was ready for a better location. He sold his shares in the business and shared a stall space in Virra Mall in Greenhills with his cousin and called it Cybercomm. This acquire and conquer tactic worked for the budding entrepreneur for years that followed, opening a string of brands and branches that built his reputation in the local tech retail community. There was Command and Conquer (his first gaming store) in 1996; Games and Gadgets in 1998; and @Games in 1999. “I sold my shares in the companies that I had a partner, simply because I realized I can work better on my own,” Paw said. The early 90s also molded him to be the go-to guy of the early loyalists of Apple products. When Paw bought his first iPod, he wanted a sleek casing for the gadget so he decided to buy one online. “It was so expensive, so I decided to buy three more so my shipping cost would be free. I sold the three others to the online Mac user community and from then on, I never stopped,” he said. Call him opportunist, but Paw sought every smart chance he got to grow and get better that at the turn of the millennium, Digits Trading was born. From a small stall in Virra Mall, Greenhills with five personnel, Paw now manages 400 employees in their own office building in Cubao, Quezon City. The growth still overwhelms Paw from time to time, keeping himself grounded and admits he has much to learn. “I’m always curious on how to improve and get better. For me, if I know we are not adept in a specific topic, we will get an expert to teach us and lead the team,” he said. The tech enthusiast turned mogul may not consider himself academically excellent, but he is notorious with research and details. Every time the brand grows, he taps an expert to handle things better. He has hired a management staff expert to keep their organization chart in check, a customer service expert for their stores, and a known designer to help the company with branding. “I’m open-minded [to learn new things]. I’m not egoistic, that when I know you are a branding expert, I’d believe more on what you say since I know you’re good with what you do,” he said. Paw talks of his journey like the cards laid out by itself, but the last decade was not spared with challenges. His enthusiasm to learn and collaborate lead him to some bad eggs too, but he is quick to brush it off as part of the job. “I always tell my people it’s okay to fail because it’s an opportunity to learn. I mean, at least we tried. It’s always trial and error,” he said. 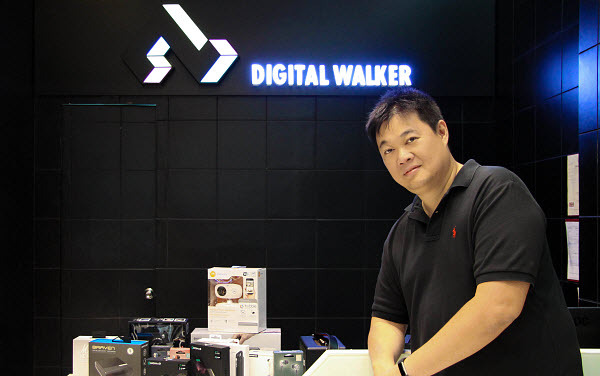 Their Digital Walker branch in Century City Mall, Makati City for instance was once occupied by a standalone branch of Sony but it had lukewarm reception from the public. “Sometimes, the location is great but we set up a wrong concept. I insist to try again because the space will go to waste,” he said. Even with the booming e-commerce, Paw confides the business has not been hurt. In fact, the more branches they open, the stronger it becomes. He is bullish enough that he aims to reach 100 branches in the next two years. 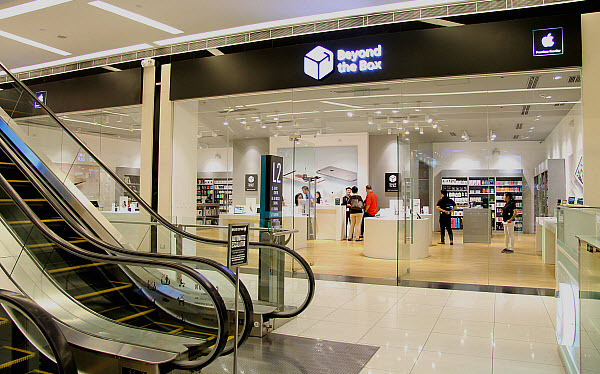 At present, there is now a Beyond the Box branch in Guam to test their chances abroad. “People are willing to pay more now as long as it’s a quality product. 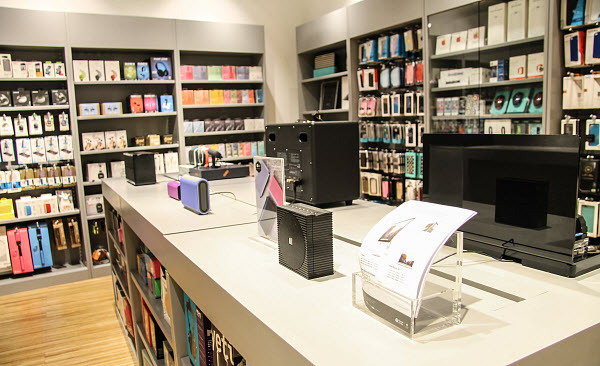 Each of our brick and mortar store also promises a different customer experience,” he said. To reach this ambition, Digits Trading is introducing three more store concepts for various niche this year. 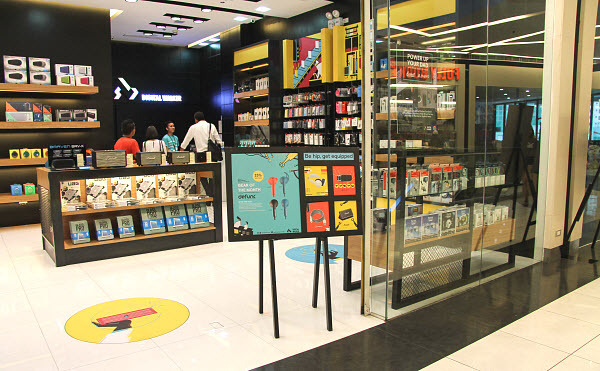 There is OMG for the low-end market with 90% of its products priced P3,000 ($63.98) and below; Checkpoint, a tech accessories store for the traveler; and Outerspace, the company’s online store platform. When asked who thought of the store concepts, Paw admits with a smile it was his idea, then immediately credits his team for helping him build it up. “It [the last 20 years] really happened so fast, most of the time, I don’t plan the next step,” Paw said. Well, if the last two decades are to be seen, Paw knows where he is heading.